Assisted in Election by Jews. Elector of Saxony 1694-1733, and from 1697 king of Poland with the title Frederick Augustus I.; born at Dresden May 12, 1670; died at Warsaw Feb. 1, 1733. He confirmed the privileges of the Jews, following the example of his predecessor, John Sobieski (1674-96); but while that monarch always manifested a friendly disposition toward them, Augustus II., with his lavish expenditures—which impoverished Poland and laid the foundations for her future misfortunes —was quite indifferent to the condition of the Polish Jews, who had hitherto always been protected by the throne. This indifference was in face of the fact that the Jewish bankers—Oppenheimer of Vienna, Liebmann of Berlin, and Meyer and Lehmann of Dresden—furnished the greater part of the 10,000,000 thalers used by Augustus to buy up the Polish nobles for the purpose of securing the throne. Another Jew, Berend Lehmann (b. 1659 at Halberstadt), furnished the money necessary for his coronation at Warsaw, and in order to do this he negotiated the sale of the hereditary estate of Quedlinburg to Brandenburg for 340,000 thalers (according to Vehse and Gretschel). 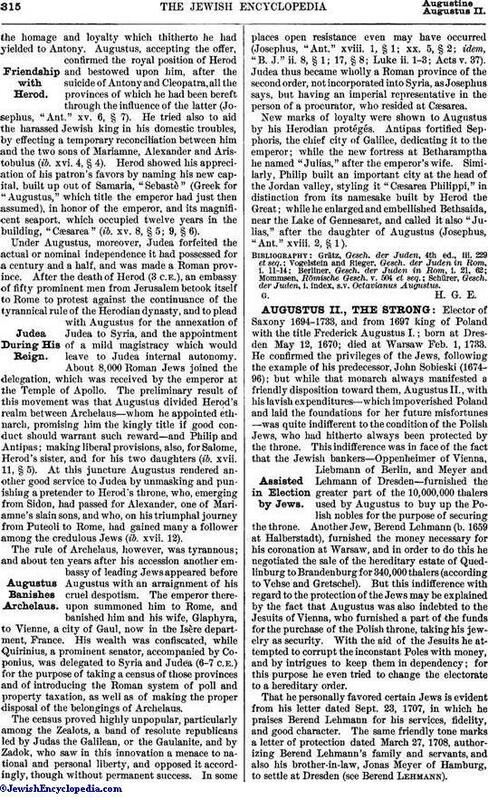 But this indifference with regard to the protection of the Jews may be explained by the fact that Augustus was also indebted to the Jesuits of Vienna, who furnished a part of the funds for the purchase of the Polish throne, taking his jewelry as security. With the aid of the Jesuits he attempted to corrupt the inconstant Poles with money, and by intrigues to keep them in dependency; for this purpose he even tried to change the electorate to a hereditary order. That he personally favored certain Jews is evident from his letter dated Sept. 23, 1707, in which he praises Berend Lehmann for his services, fidelity, and good character. The same friendly tone marks a letter of protection dated March 27, 1708, authorizing Berend Lehmann's family and servants, and also his brother-in-law, Jonas Meyer of Hamburg, to settle at Dresden (see Berend Lehmann). During his reign the discipline in the Polish army became very lax, and the Jews suffered much from the violence and robbery of the soldiers. The Catholic clergy ordered the enforcement of the decree of the Council of Basel instituting conversionist sermons in the synagogues, which decree had hitherto remained a dead letter. In vain did the Jews ask to be relieved from such sermons, pointing out their futility. Often this preaching could be maintained only with the aid of military force, as, for instance, at Lemberg in 1721. The land-owners, synods, and courts took energetic measures against the renting of inns by Jews. The poll-tax was collected from the Jews through their "kahals" with more energy than ever before, even after the long wars with Charles XII. of Sweden had ruined the Jews. At the Diet of 1717 in Warsaw, the Jewish poll-tax was still more increased. The gentry (shlyakhta), the merchants, and the gilds soon observed that the Jews no longer enjoyed the favor of the throne, and their attitude toward them became more and more hostile. The ordinances of the Catholic Church exceeded in hostility to the Jews those passed in the seventeenth century. The animosity between the Jews and the Christians at this period was more of a religious than of an economico-social nature, as had been the case in the preceding period. 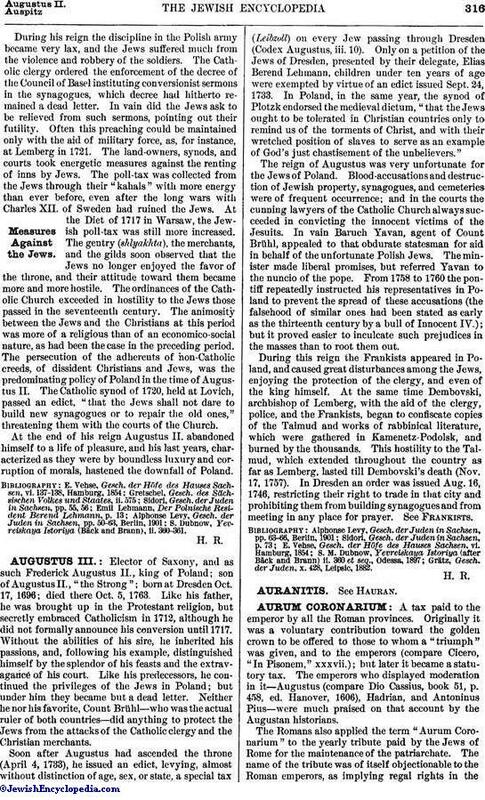 The persecution of the adherents of non-Catholic creeds, of dissident Christians and Jews, was the predominating policy of Poland in the time of Augustus II. The Catholic synod of 1720, held at Lovich, passed an edict, "that the Jews shall not dare to build new synagogues or to repair the old ones," threatening them with the courts of the Church. At the end of his reign Augustus II. abandoned himself to a life of pleasure, and his last years, characterized as they were by boundless luxury and corruption of morals, hastened the downfall of Poland. S. Dubnow, Yevreiskaya Istoriya (Bäck and Brann), ii. 360-361.